Because we know we will make a difference in the fight to end breast cancer. We know that by raising funds and walking in the American Cancer Society Making Strides Against Breast Cancer event, we will help save lives from breast cancer. We believe that one day breast cancer will never steal another year from anyone’s life. 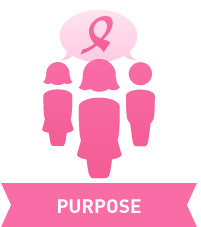 Making Strides is not only our opportunity to join our community to fight back against breast cancer, but it is also a way to inspire hope by raising funds and awareness to help those facing the disease. That’s why we’re walking.